MeteoroiD has announced that they will disband after their oneman at Shibuya REX on February 11, 2017. It's been about four years since the band's formation. After undergoing a member change and even a band name change, the members of MeteoroiD have decided to end their activities as a group. The band's previously announced mini album “83” and commemorative tour will be cancelled as well. We are so thankful to those who have supported MeteoroiD in the past. We have a very important announcement for everyone. Following our oneman performance at Shibuya REX on 2/11/17, MeteoroiD will cease all activities. We are really sorry to all of our fans and staff who have supported MeteoroiD that we are making this announcement so suddenly. Regarding the reason, the balance that we had perfectly preserved began to crumble, and we decided that we wanted end with MeteoroiD shining the brightest at this moment. Once more, as the band members all felt very strongly about ending on 2/11, the day in which Meteoroid was born, the previously announced mini album "83" and the mini album "83" commemoration tour will be cancelled. We apologize. We want to really thank all of the fans and staff who have supported us in the few years since we began activities. There's only a short amount of time until 2/11/17, but both the band members and staff will give it their all, so please look forward to it. In regards to the members, we kindly appreciate your unchanging backing and support. On 2/11/17, MeteoroiD will disband. Upon speaking with all of the band members, we were unable to find a solution aside from disbandment. The staff, even those that could support us only 1%, gave their all until the bitter end, but even so it's come to this announcement. I knew from the beginning that "one day it will end" but now that it's come it's still no good. It's true that I still can't find an answer to what words would be good to write. Regarding everything after 2/11, we determined that that day would be MeteoroiD's limit and so we decided to cancel everything after. I am really sorry...that is the limit of the 5 of us To everyone who loved MeteoroiD (METEOROID)! Thank you so much. In order to tell each one of you thanks, I will sing with all of my heart until the very end. On 2/11/17, I will commit lovers suicide with my beloved MeteoroiD (METEOROID). I'm sorry for making an announcement like this. After having this discussion, it makes my chest tighten when I read the letters and fanmail from everyone. But, I don't have any regrets and this was a unanimous decision that was made in order for us to all move forward. Unfortunately this is how things have turned out, but in the future I want to remain in the same place as all of you because you've become so important to me, but first I want to rush forward to 2/11 with all of my being. Thank you so much for everything up until now. With that announcement, my activities as "MeteoroiD's Machi" will cease. From the beginning and until now, lots of different things have happened within MeteoroiD including members leaving and new members coming in, but throughout it all, you have loved us unconditionally and I thank you so much for that. Those times you made me feel needed and gave me a place to belong, and the times I needed you and gave you a place to belong may be over as far as MeteoroiD is concerned, but they will be a part of me forever. Despite lies and betrayals, no matter what happens, each and every one of you are here for me right now. Without changing, let's meet head-on with no regrets in the remaining time we have. 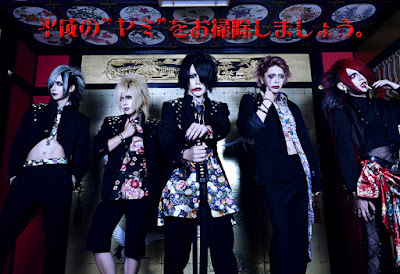 As "MeteoroiD's Machi" I will continue to provide a place where everyone can feel they can belong until the final day. First, I'm sorry to surprise you with this abrupt announcement. We are superior, and so in order to be able to move forward, we made the decision to disband. Many things have happened since the band began and up until now, but in those times we've been able to overcome them together. Everything is an important treasure. I believe from the bottom of my heart that we've been able to come this far because of our staff and the help of everyone who's supported us. I really want to thank you all. Although MeteoroiD's activities and live shows have become few, I want to be with all of you. Please look forward to MeteoroiD and MeteoroiD's raL until the very end. I'm really sorry for announcing so suddenly. We were a band where we diligently worked to reach one objective, and had mutual enjoyment doing it together. While it would have been good if we experienced the same enjoyment from everyone from now on, in order to pursue everyone's goals we'll continue to step forward but for right now we've taken the time to decide what's really the right thing to do. We want to conclude by showing you the MeteoroiD that's no less than the MeteoroiD now. For this reason, I've arrived at the conclusion that the current MeteoroiD can no longer be in the pursuit of this hindered dream. For this reason, our last duty as MeteoroiD will be to be the current best MeteoroiD that's able to reach you all. We also always thought how to become a place where everyone could belong. I will not forget our work and activities up to this point. I'd be very happy if we could continue to live on in everyone's hearts. This band was also a place where I could belong, so I want for MeteoroiD to live on in everyone's heart's, together. We also received many precious experiences. We were able to spend the best time together with you all. There's only a little time until 2/11, but we'll continue on as MeteoroiD full force until the end. Thank you.